An evening with a difference is how I would describe last evening. We were a whole bunch of foodies packed into a room, but we were not there to eat or sample any dishes. It was going to be an evening of learning and sharing. 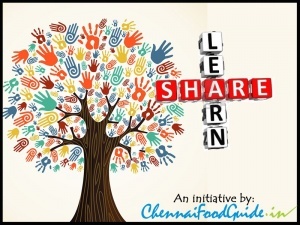 The new initiative from CFG aptly titled "Share and Learn" had its 1st session at Azzuri Bay last evening. A small group of about 25-30 members were present, apart from the 3 presenters and the one hour dedicated to the presentations flew in a jiffy. After a brief tug of war with the TV, and with not one or two but 5 guys pouring over the computer and TV, they gave up and decided to use the laptop to show the presentations while the ladies spoke. Opening the evening was Smriti Kirubanandan . With a degree in engineering, she is a long distance runner, yoga practitioner and someone who believes in Raw Food concept. She spoke about the three categories- Raw Vegan, Raw vegetarian and Raw meat, and her life since she switched from normal diet to Raw Vegan. It was interesting and insightful to say the least, and I wondered if I had half the amount of conviction she did to make the leap. She was not preachy, not advocating that people switch over, but spoke about the positives of such a diet. It was an eye opener of sorts and we all wondered how easy it was to follow this diet in India. She did mention it was easier in the western world, but it was not impossible here, especially since we had quite a few Organic products available out in the market. 5. Overall health and fitness maintained. She did mention that she had begun incorporating a small cup of regular food. There are times when she is out and has no choice but to eat some normal food, and to avoid her body reacting strongly, she has begun making it a part of her daily regime. Smoothies, salads, fruits, shakes, nuts, almond milk, sprouted grains are what you can eat if you follow this diet. And if you are a Raw vegetarian, you can include raw milk and raw diary product as well. Phew... Imagine living on bananas and papayas? Anyways, breaking into my thought, Sanjeeta K Kumar took over the stage and began talking about Food Styling & Photographer. I have interacted with her at multiple occasions and kinda knew what she did. Her forte are creating rustic images. I enjoy photography but have never been able to take a good shot of food items. Listening to her talk about the impact of light, props, colour or material of the plates, cutlery used, the rule of the 3rd gave me quite an insight into what to do or not to do. She showed off a few of her photographs, emphasising on how it is best to keep it simple and make sure the food item is the hero of the dish. Not only emphasizing s she a great photographer, she cooks/bakes amazingly well as well. Last weekend, she brought us brownies and cake at the Chennai Blogger meet and they were both divine! She also told us how most of the ad copy photos we see are taken not with the original food item but with something else that is made to look like food. For ex, potato mash for ice cream, red tar for tomato sauce and so on.